Lunches are known to create an incredible amount of waste, originated from packaging. The site Waste Free Lunch dedicated to this problem. Their data is based in USA statistics, however any developed countries will be able to use their information to apply similar projects, for schools or offices. 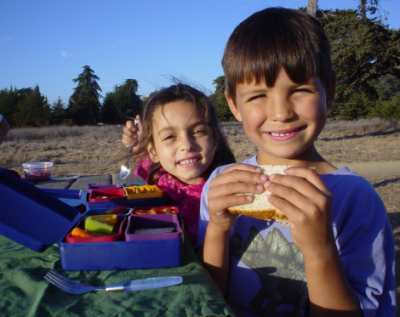 Most parents pack lunch items in single-use plastic bags, aluminum foil, or wax paper, or they purchase single-serving items that come in their own disposable package. Admittedly, these products are extremely convenient, but what is the environmental cost to a country that relies so heavily on them? Landfills are full and overflowing. Incinerators pump contaminants into the air. Much of the trash we generate comes from the packaging on the food we buy, and lunch foods are no exception. In fact, it has been estimated that on average a school-age child using a disposable lunch generates 67 pounds (30kg) of waste per school year. That equates to 18,760 pounds (8,500 Kg) of lunch waste for just one average-size elementary school. What can we do to reduce lunch waste? Start local! Start a waste-free lunch program at your school. Many schools across USA have begun to do so, and they're truly making a difference! 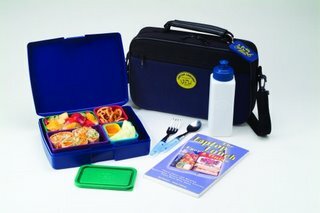 A waste-free lunch program is a process of educating students, parents, and school staff about where our trash ends up and how we, as individuals, can reduce the amount of trash we generate. Waste-free lunch programs favor the use of reusable food containers, drink containers, utensils, and napkins. They discourage the use of disposable packaging, such as prepackaged foods, plastic bags, juice boxes and pouches, paper napkins, and disposable utensils. What does a waste-free lunch look like? What does it cost to pack a waste-free lunch?